For this roundup, we tested three videoconferencing solutions: vMix Call, Telestream Wirecast Rendezvous, and NewTek TalkShow. In each mini-review, we cover the two critical steps—initiating the call, and then assembling the various host and guest inputs into a shot you can push out to any streaming endpoint. If you perform enough interviews for live streaming, before long you’ll want to interview someone who’s not at your location. Although the prevalence of these types of interviews on TV makes them appear simple, for a long time they were anything but for live streaming, requiring either expensive hardware or Rube Goldberg-ish combinations of Skype or other conferencing programs with funky patch kits and audio connectors. Meanwhile, with outlets like Facebook Live and Twitter, the demand for a simple and affordable conferencing solution increased exponentially. NewTek achieved the first part of the equation when it shipped TalkShow VS 100 in February 2015, though the $3,995 price tag was out of reach of most casual producers. Only recently, conferencing became affordable when the availability of WebRTC (real-time communications) in browsers and compatible products spawned vMix Call in February 2017 and Wirecast Rendezvous in September 2017. For this roundup, we tested all three solutions, which involved setting up and holding multiple conferences between editors and other third parties. In each mini-review, we cover the two critical steps—initiating the call, and then assembling the various host and guest inputs into a shot you can push out to any streaming endpoint. For the record, we ran vMix and Wirecast on my HP zBook portable workstation driven by a 2.8GHz Intel Xeon E3-1505M v5 CPU, with 32GB of RAM running a 64-bit version of Windows 10. For guest logins, we used Chrome for all tests on both Mac and Windows computers. We tested TalkShow using a TriCaster Mini. vMix is a Windows-only program developed and maintained by StudioCoast Pty Ltd., and while a free version is available, you’ll have to spend $350 to conference in one caller (HD version of the software), $700 to conference in two callers (4K version), or $1,200 for up to eight callers (Pro version). When we installed the program, the setup utility loaded both a 32-bit and 64-bit version. Note that only the 64-bit version supports vMix Call, which can get a bit confusing if you run the wrong program. Although we didn’t test this, you should be able to access vMix Call from Android devices using Chrome and iOS 11 devices using Safari. You build your vMix projects by creating multiple inputs, such as cameras, audio devices, titles, audio and video files, and the like, each stored separately in a content bin. Once you’ve created your inputs, you shuttle each one in and out of the preview and live window via simple mouse clicks or keystroke commands. 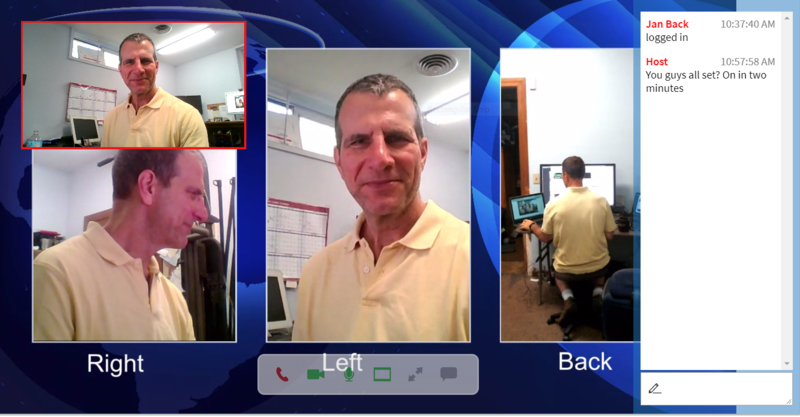 As you’ll see, you integrate multiple inputs like remote guests into a single presentation using a virtual shot. You start the conference by adding a Video Call input, which gives you a numerical password to send to your guest, who will log in by entering their name and password into www.vmixcall.com (Figure 1, below). In this dialog, you choose the video source and bandwidth to send back to the guest, plus the audio source. In most cases, you’ll send the program feed and master audio back to each guest, and vMix will automatically remove each guest’s audio from their respective feed so they won’t hear an echo over their speakers. When working with multiple guests, you’ll repeat this procedure for each one, and each gets a unique login. If you’ll be working with the same guests multiple times, you can save the inputs in a vMix preset and the password won’t change—a great feature. As mentioned, each guest logs into www.vmixcall.com, enters a name and password, then enters the screen shown in Figure 2 (below). The big screen is the program feedback from vMix, while the window on the upper left is the preview from that computer (placed in the middle window in the composed feed). Note the text chat window on the right, a useful feature for communicating with your guests. Figure 2. Here’s what the guest sees if you send back the master channel. The easiest way to create the program feed shown in Figure 2 is to add a Virtual Set and choose from one of the many multiwindow presets. vMix provides a simple but highly functional editor (Figure 3, below) you use to choose the shots for each input box, which automatically crops the sides to make all windows fit. Add a simple text title and you’re done. The whole operation should take 10 minutes or less once you know what you’re doing. After you compose your shot, you preview and take the shot live just like any other input. The only hiccup I encountered in testing was that while each guest’s audio was correctly excluded from the master output, the host audio was included in the master feed, which meant that the host could hear himself in the main output. You have two options to eliminate this. First, when you configure the audio input, you can select a checkbox that eliminates that feed from the headphones. Or, click the Cog icon next to your mic input to open the settings window, then drag the headphones audio knob on the extreme lower left down to 0. During the call, you can right-click any guest input and choose Open Call Manager, which contains the chat window, general connection status, and detailed statistics regarding each input and output in the call. Interestingly, vMix was using VP8 video and Opus audio for all conferencing communications. We produced our three-person chat at 720p30. On my HP zBook notebook, when recording to 720p at 4Mbps using the hardware-based Intel H.264 codec, vMix CPU consumption averaged around 16 to 20%. Dropping down to one guest reduced CPU usage to around 15%. Most of the video from all three sources was smooth, but there were some frame drops with higher levels of motion. So long as your guests don’t pull a Tom Cruise and jump up and down on a couch, you should be OK.
One very cool feature is the ability to push any vMix inputs, direct or remote, out via Network Device Interface, which means that you can use vMix Call to input callers into NDI-compatible mixers such as the TriCaster discussed below. 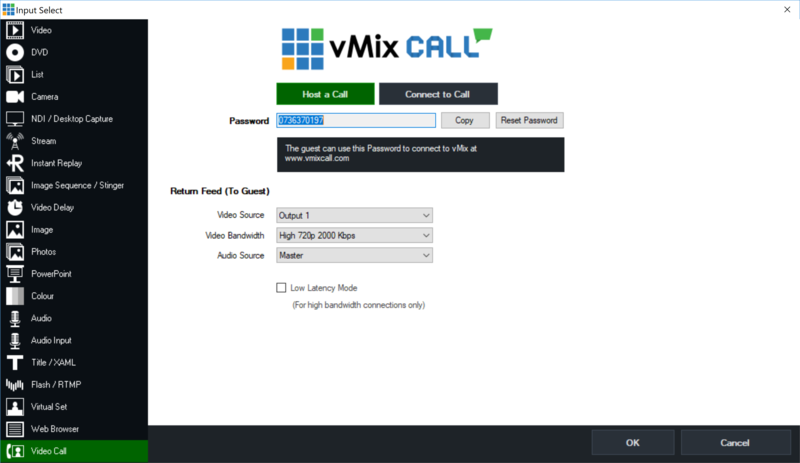 If your remote caller has vMix installed, you can directly connect via vMix, which should enable 1080p calls, bandwidth permitting.